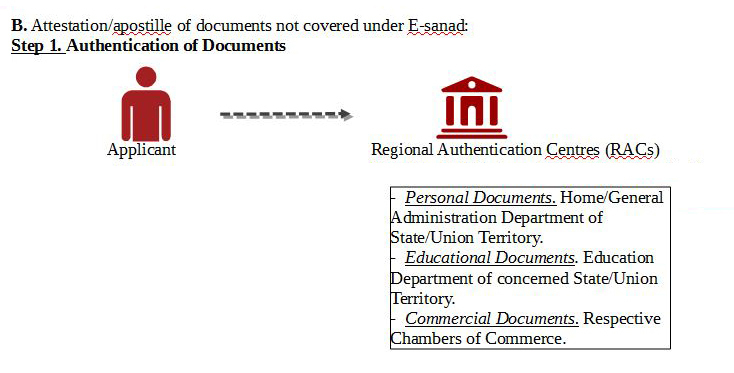 A. E-sanad: A. E-sanad: e-Service for verification & attestation of documents of Indian Citizens. Detatils of e-Sanad can be obtained by following thefollowing Link. Step 2. Deposition of Documents with authorized Outsource Service Provider. Step 3. Receipt of apostilled/Attested documents from Outsource agencies. Legalisation of documents: The Ministry of External Affairs thereafter, legalises the documents on the basis of the signature of the designated signing authorities of the State Government/Union Territory/Chambers of Commerce. Hence it does not take responsibility of the contents of the documents. Outsourcing of receipt and Delivery of Documents. As a result to outsourcing of receipt and delivery of documents for attestation/Apostille with effect from July 2012, no document is directly accepted from individuals at the Ministry of External Affairs Counter at CPV Division, Patiala House Annexe, New Delhi. The original document/true copy is to be submitted directly to any of the five outsourced service providers along with a photocopy of the document and a photocopy of the Passport of the applicant. It would be pertinent to point out that the Ministry does not legalize photocopies. Applicants are advised not to rely on unauthorised persons/touts for Apostille or Attestation services. Decentralization of Attestation/ Apostille Services. W.e.f. January 01 2019, Attestation/Apostille services have been decentralized to Branch Secretariats/RPOs in 15 cities Ahemdabad, Bengaluru, Bhopal, Chennai, Chandigarh, Cochin, New Delhi, Guwahati,, Hyderabad, Kolkata, Lucknow, Mumbai, Panaji, Raipur and Thiruvanantapuram. The contact details of these RPOs and the collection centres of the five service providers in these 15 cities are as given above.NORKA ROOTS, a public sector company under the Department of Non-Resident Keralite Affairs, Government of Kerala is authorized to submit documents for Attestation/Apostille by RPO, Thiruvanantapuram . Applicants are requested to approach their respective Branch Secretariats/RPOs as enumerated above through the five outsourced service providers for obtaining the requisite services of apostille/attestation as required. 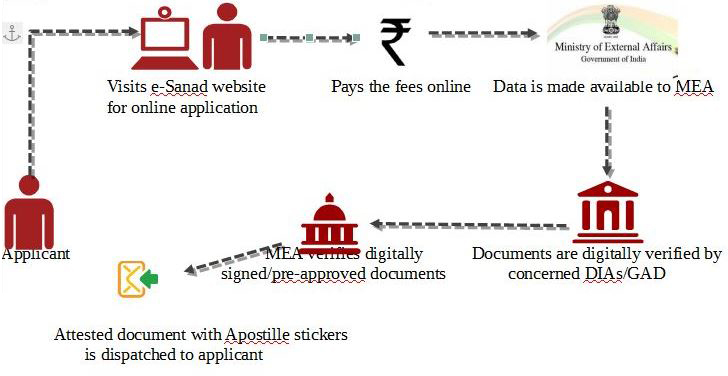 MEA: A fee of Rs 50 is payable for Apostille of document. (W.e.f 21 December 2016, payment by means of postal orders has been discontinued.) Normal Attestation is done free of cost. Outsourced agencies: As the Ministry of External Affairs (MEA) is not accepting documents directly from the applicant/individual, all documents for the purpose of Attestation/Apostille by MEA are to be submitted and collected from the four designated outsourced agencies. The fee chargeable by the outsourced agencies per document for its collection and delivery for Apostille/normal attestation by MEA will be Rs. 90/- (Service Fee) and Rs 3 per page (Scanning Fee) .